As of today, March the 27th 2017, it will be one week since the "bombogenesis" nor'easter (snowstorm) named, Stella, did her (ahem) "magic" in many parts of the northeastern part of the United States. The snow which fell during her time in NYC, where I live and have my rooftop garden, was not our first snowfall for March of 2017. 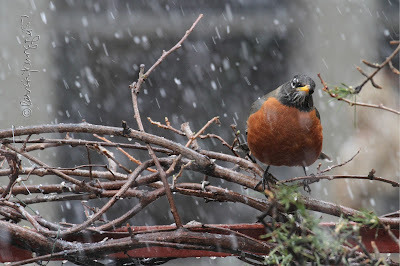 The picture atop this entry, which was taken in my place, shows an American robin alighting upon the branches of my kiwi vines, during a snowfall that occurred here on a little over three weeks ago on the10th of March. Some folks in NYC found it unnerving because during the month of February, we had some very warm days, which followed our groundhog's prediction of an early spring. 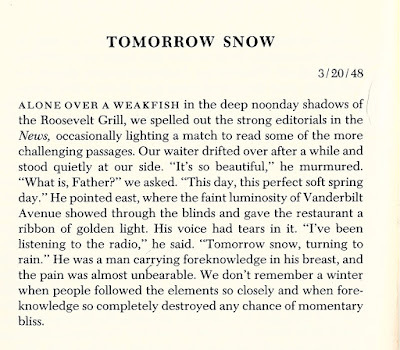 However, that aforementioned snowfall during the month of March, when an early spring had been predicted, was not a first for NYC. 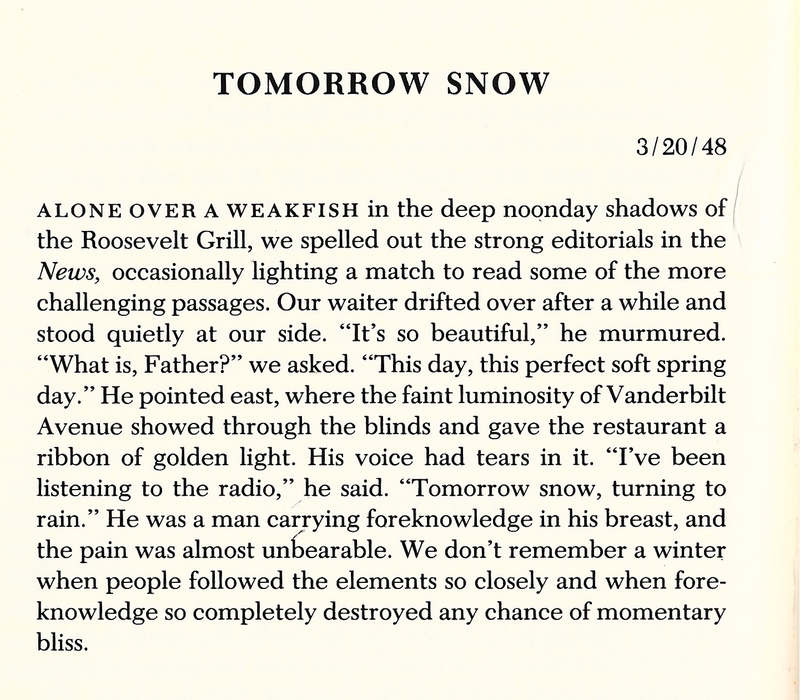 In his mini-essay, TOMORROW SNOW, (which was published on March the 20th in 1948), E.B. White discussed this phenomenon. 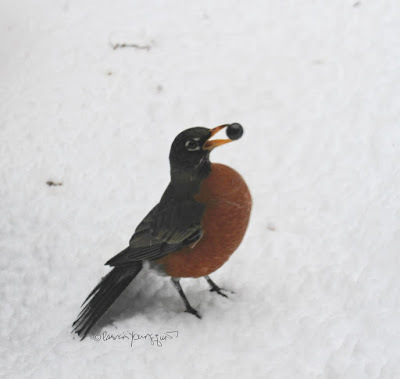 Because I grew up in Illinois, I'm no stranger to snow occurring during the month of March. And, I do recall some severe snow storms happening in this month. 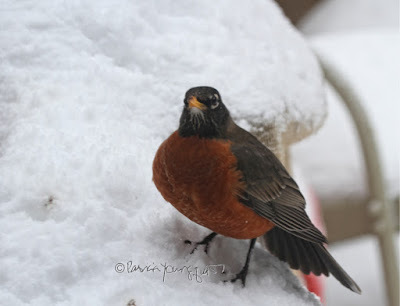 However, I never got to observe the antics of wild birds as I did during Stella. I've written about it in my recent entries here on Blogger, which I posted on March 14th, March 15th, March 16th, and, March 18th. 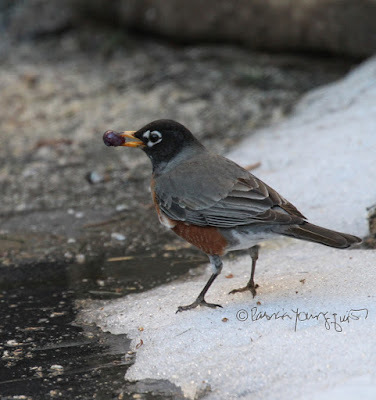 Today I'd like to share something new that I learned re the small songbirds (who are also called perching birds or passerines): "They have very little feeling in their feet because their feet have few nerves and blood vessels. 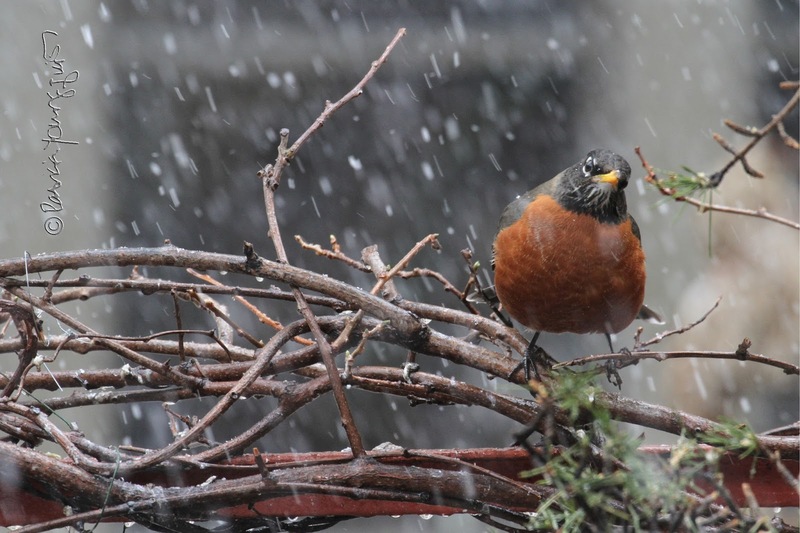 This adaptation allows songbirds to land on cold perches such as wires when the weather is frosty." During Stella, I certainly observed a number of small songbirds (including an American robin), who seemed to cope well in terms of having their tootsies tolerating the elements. This continued to be the case five days after most of the snow from Stella had melted, but stubborn patches of frozen-snow remained.